Industrial wipes will help you to clean up after a messy job whether you’re a trade professional or just doing a bit of DIY. As well as cleaning your hands, these wipes will deal with spills, drips, tools and work surfaces. Industrial wipes will clean almost any kind of mess. That includes wet and semi-dry paint, bitumen, foam and silicone sealant. 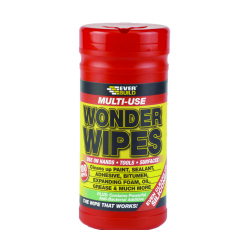 These wipes are great if you’re working in trades like building, plastering or roofing – especially if there’s limited access to water on site. For professional use we stock a massive tub holding 300 wipes. Industrial wipes are just as handy for DIY use. When decorating, simply wipe up the paint drips as you work – it makes the job so much easier. The wipes even have an antibacterial additive. This gets rid of bugs and bad odours after working on messy jobs like drains and gutters. For DIY or domestic use we stock a smaller tub of 100 wipes. Now there’s no excuse for leaving oily stains and fingerprints when you finish a job!